A bowl of hearty, creamy mashed potato is the perfect complement to any meal. Follow these few easy steps to raise your mashed potatoes to a new level. Mashed potatoes play an important part in many of our classic dishes such as shepherd’s pie and as a side dish for roast dinners. But this great comfort food is also an easily prepared accompaniment to many meats, fish and vegetables. 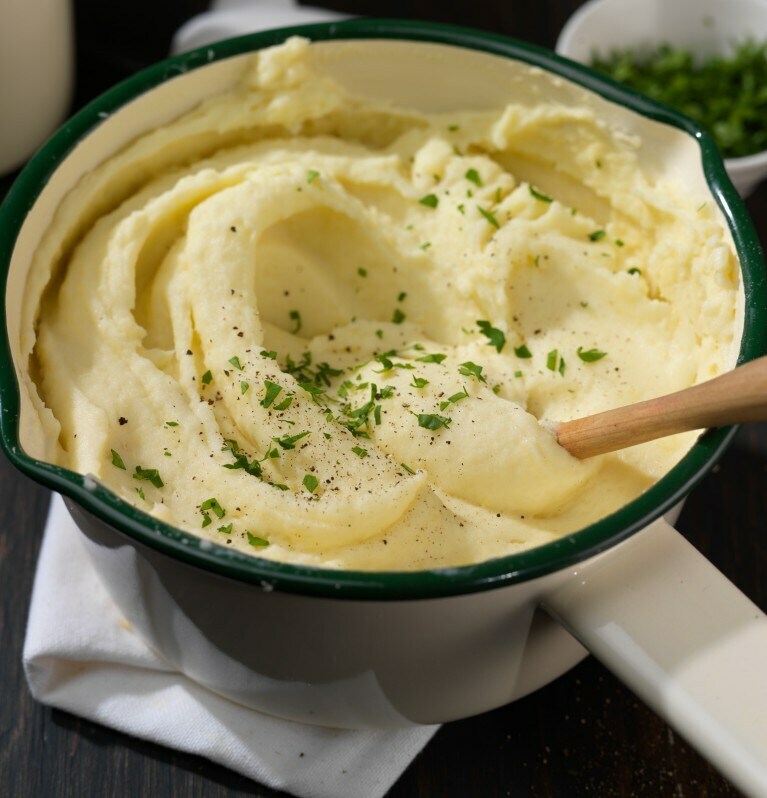 Whether you like them light or creamy, flavoured or plain, buttery or smooth, we’re here to offer some tips on how to prepare mash potatoes just how you like them. In order to make the perfect mashed potato, with great texture and deep flavour, choosing the right potato is vital. Potatoes are generally divided into two types; waxy and floury. Waxy varieties such as Yukon Gold potatoes are ideal for salads and can be eaten hot and cold. They are not ideal for mashing. To achieve a light, fluffy mash with rich flavour, floury potatoes such as Russet potatoes are recommended. Once you’ve bought the potatoes, knowing how long to boil them for is essential. If boiled too long they will break apart. If left even slightly uncooked the mash will end up with lumps. Ideally, you want them to become tender and soft. The best way to know when to stop boiling is to pierce the potato in its thickest part with a skewer. When cooked through, the potato becomes soft in the centre. Once cooked, you should drain the potatoes and then return them to the pan, covering them with a lid and allowing them to steam for at least 5 minutes. This will dry out the potatoes slightly and help them retain a texture that easily soaks up the milk and Becel® Buttery* that you’ll add next. Adding milk and Becel® Buttery* to the potatoes will make the mash rich and creamy and helps bind everything together. 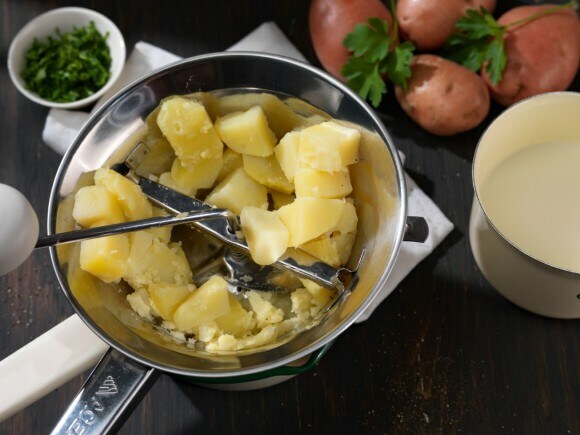 Before adding to the potatoes, you should first heat (but do not boil), the milk and Becel® Buttery* in a saucepan until the Becel® Buttery* has melted. This helps to keep the temperature of the mash warm for serving. Use a masher/ricer first to mash the potatoes, then add the heated milk and Becel® Buttery* then use the masher or the back of a wooden spoon to mash the potatoes further and combine the liquid, until you achieve the desired smooth consistency. At this point you can stir in any extra spices or seasoning, depending on what you like best. Spinach Mash: Add a couple of handfuls of chopped spinach right at the end. Garlic Mash: For an extra punch, try adding a Knorr® Savoury Herb with Garlic Recipe Soup Mix. This will infuse a deep, powerful taste to the creamy mash without having garlic bits. Mustard Mash: Add Wholegrain Mustard. Spring Onions: For added depth try spring onions, no need to cook, just chop finely and mix them through the hot mash. Also try the combination of Knorr® Homestyle Stock Vegetable Bouillon, spring onions, Becel® Buttery* and some milk. This is a mash packed with flavour and the perfect accompaniment to your roast or grilled meats or fish.